Brian Zimmer will manage the project Moving Jython Forward. Software developers - diarists or novelists? In this article article I argue that there are too many diarists and not enough novelists out there writing software. I just noticed that periods in GMail addresses seem to be filtered out. I can start an e-mail to myself with a destination address of "s.e.a.n." at gmail.com and it will still get through. I haven't thought of a use for this feature yet. Suggestions? Looking through my sitemeter logs as I'm wont to due from time to time I found this article from Eamonn McManus who is now at Sun. He was in my class in TCD from 1983 to 1987. Lets see, I reckon its about fifteen years since I met Eamonn. A small world. What is the most fun you could possible have with a cellphone? Pick up your Expat XML Parser and XPath implementation for the Nokia Series 60 cellphone here. It has taken generations for this simple, brilliant idea to take hold in this industry. As a relatively recent convert to TDD I can attest (sorry) to the power this simple idea encapsulates. I do a lot of work in the Java ecosystem. Two words spring to mind - actually three. Confidence, documentation and Jython. Documentation : "Read the source, Luke" has been joined by a less daunting epiteth : "Read the tests, Luke". Test scripts are a great source of real documentation for how objects/methods/apis/interfaces are to be used and not to be used. When the Javadoc fails you, hit the tests. Jython : Anybody coding in a statically compiled programming language that is not using a dynamically typed programming language for the tests, has missed a golden opportunity for a productivity leap. In the C world, CPython. In the .NET world, IronPython. In the Java world, Jython. Write Eclipse JUnit Tests in Jython - this is a recently published article about unit testing with Jython but there are tons more. Google is your friend. the whole shebang to be controlled from a graphical console. Fast forward to forward compatibility is this weeks ITWorld e-Business in the Enterprise article. It concerns the lopsided relationship between forward and backward compatability in the application software game. Coming to a NetBeans distro near you soon : dynamic-language infrastructure. Splen. Brill. Excele. Aweso. Fanta. Today I finally got around to putting a news update on jython.org and sending an e-mail to the Jython lists about recent events of interest. I have added some entries to Jython users. If you have any Jython project you would like to see listed, let me know. Tunnelling through application mountains is a noodlet on the fact that software is in fact a mutant strain of hardware - sort of. No matter how flexible an application' model of the universe is, business needs will find a need to break it - to need something that cannot be done. Users will respond to such limitations in software systems by creating semantic "tunnels" to get around limitations in the model. The result is a system in which less of the logic is computerised than perhaps you initially thought would be computerised. Lots of interesting stuff becomes tacit knowledge in the brains of users. The truly flexible "soft" stuff is people - not software. Hierarchies. Cannot think within them. Cannot think without them. Jet lag has its uses. bookshelf updated. One day, I will write this book. I have removed it from my blog template because every day it reminds me that I haven't worked on it in ages and every day reminds me of how unlikely it will be that I get to it any time soon. I had the great privilege earlier this week to meet with some household names in the Java, Python, Jython, Perl, Groovy and XML worlds. The meeting was instantiated by Tim Bray to talk about dynamic languages on the JVM. I met Samuele Pedroni for the first time and had the pleasure of watching him step through some of the details of Jython's implementation at the whiteboard. I also now know more about how Groovy is implemented thanks to James Strachan. Dan Sugalski and Larry Wall's expositions of Perl internals and the Parrot VM were fascinating and at times, mind warping. Obviously, I share Tim Bray's belief that dynamic languages are a hot area. There are literally dozens available for the JVM right now. Obviously, I am biased in favour of Jython as a general purpose "glue" language for programming on the JVM. If you want to take my advice on board wholesale, get into Jython. If you don't want to go that far, get into *a* dynamic language for the JVM - any dynamic language is better than no dynamic language. Do your Java productivity a favor - catch the wave. Congratulations to the PyPy folks on their funding from the EU. I met with Samuele Pedroni of Jython fame for the first time face to face in California earler this week. (More on our Californian adventure in a subsequent post). Samuele is off to Sweden to work with the PyPy team in the new year. Best of luck Samuele! Audio versions of some of my ITWorld articles are now available on McGrath's Musings. We will be adding more columns soon. Via John Naughton comes a pointer to http://becker-posner-blog.com/ a site where two heavyweights of thought will duke it out. What a great idea! We could do with this format here in geekdom. It could make for some very interesting blog reading. Two participants. No muli-threading or noise such as that which gets in the way on mailing lists or usenet. None of the size restrictions that come with blog commenting systems. The end of digital downloads is this weeks ITWorld eBusiness in the Enterprise article. Kick off a big download before you read it. The dulcet tones (to an oscilliscopes ear) of gigabytes whizzing through the aether will make for a suitable backdrop. John Sowa's Law of Standards is an interesting take on the standards landscape. This story uses the noun "Plone" (as in "Plone") as a verb. Plone is what you get when you assemble some cool stuff on top of a Zope substrate, parcel it up, get people behind it, etc. Plone is very wonderful stuff because (at leat in part), Zope is very cool stuff. Zope in turn is very wonderful stuff because (at least in part) Python is cool stuff. The verbification of Plone reminds me of the birth of XML. We got XML by assembling some cool stuff on top of an SGML substrate, parcelled it up, got people behind it, etc. People use XML as a verb in a way they never used SGML as a verb. Interesting, things, verbs...I mean nouns. The call for participation at XTech 2005 is out. Methinks that this list needs to take account of whether or not a programming language is used directly or generated from another program. Yes, I was that nutcase who strapped a 300 baud dumb terminal to an Apple Laserwriter with a view to drawing wireframe teapots by programming the beast in Postscript directly. I eventually got my teapots by writing programs (in Pascal as it happens - 17th on the list) that wrote out the Postscript program to a text file. On the output side of programs that write programs is the natural home of Postscript. Python 2.4 Final has been released. See here for details. Inefficiency revisited is this weeks ITWorld e-Business in the Enterprise article. The subject is bubble wrap. Well, sort of. The subject is data normalization. A sort of intellectual bubble wrap. bitsavers.org brings you a must-have tutorial Vax VMS 3.0 from 1982! I have a photocopy of it somewhere. Crickey! That was (gasp) 23 years ago. Micah reports from XML 2004 that XForms cometh to the excellent OpenOffice in the Spring. Congratulations to Robin Cover and Jean Paoli, recipients of this years XML Cup award at the IDEAliance conference. Robin Cover's tireless coverage of everything of interest in the XML world (and before that, the SGML world) in his "Cover Pages" was and is, a treasure trove of useful stuff. My colleague Alan Wall has pointed me to this: www.the5k.org having read the article about programming in tight spaces. "A software application expands so as to fill the resources available for its creation." This week's ITWorld e-Business in the Enterprise article. Xtech 2005 next Spring in Amsterdam. Of particular interest to me is the Open Data track. The rest of what a standards body does is commercial/political agendas, egos and "research tunnelling". All very useful and important things in their own right but baaaaaad when then become W3C this or ISO that or ECMA the other. E-mail - where are all the hyperlinks? is this weeks ITWorld E-business in the enterprise article. Amazon Simple Queue Service. This is so satisfying. If I was a smoker, I'd step outside for one right now with a copy of this under my arm and a coffee. Simple Queue Service is the sort of hosted web service that makes sense to me as an application developer. I would use it in its "*on* the web" mode of course by means of the RESTian interfaces. I'd also be willing to bet real money that the RESTian uses of this facility will be streets ahead of the soapy wsdls uses. All we need is to coalesce around a simple HTTP pattern for reliable message exchange and we are off and running. I'll be posting one of these soon as part of my five-part Jython tutorial. Look out for a slew of interesting stuff on top of Amazon Simple Queue Serice. Also look out for other vendors - lemme see...search engine providers for example:-) - offering similiar pay-as-you go distributed computing plumbing services in the years to come. If you are not familiar with asynch messaging as a distributed computing paradigm, now would be a good time to get reading. this would be a good place to start. I note that BitTorrent is reported to be responsible for 35% of internet traffic. By that way of measuring things, Python has sure grown in popularity over the last couple of years. There is a lot of "dark Python" in the Universe. Stuff that users cannot see but it is there all the same. The Google spiders, all those Zope/Plone websites, all those happy Microsoft Outlook users with their spambayes plug-ins. Somebody recently said that dynamic languages provided a way to execute half formed thoughts. Lets hear it for all the half-formed thoughts out there! I wonder what pecentatge of software that meets its engineering goals of being on time, on budget, team friendly, grokkable, as flexible as it is powerful etc. etc. are based on half formed thoughts? 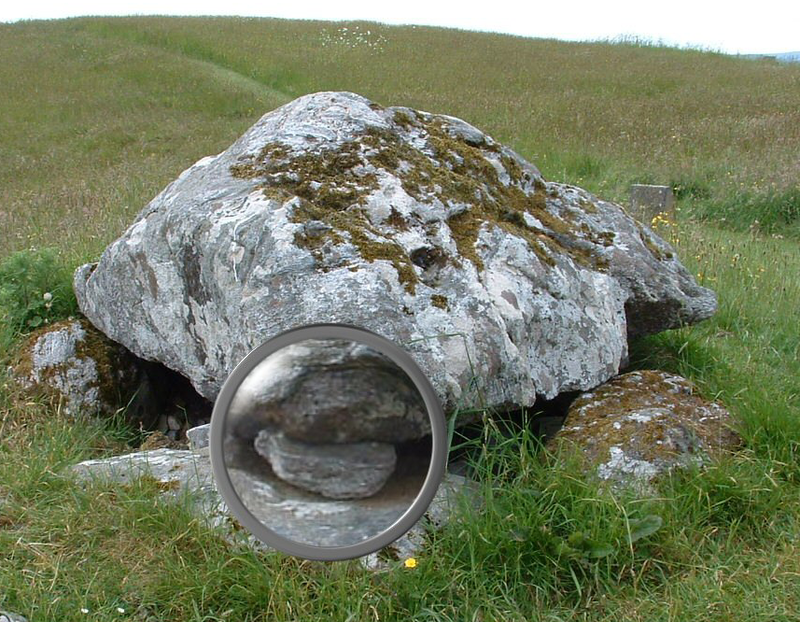 So, the hunt is on amonsgt the perspicacious blogopuli to classify what kind of a thing Gmail is from a GUI perspective. GMail looks to me like a classic bootstrap. I suspect that on the server side there is a model of the client side expressed in domain terms - concepts like inbox, e-mail composer, contacts list and so on. When a client connects, it effectively downloads an implementation of that model. Once in situ, further conversations between client and server can go up a notch - expressed in terms of domain specific concepts "render the inbox will you? There's a good chap" rather than "At X,Y render a blue box...". In my opinion, there is more power in that one idea than in the whole minatory miasma of WS-GetAGrip. See http://www.jython.org/ for links to a substantial Jython tutorial from IBM's Barry Feigenbaum. Also of note is that work on implementing new-style classes in Jython - key to the 2.2 release - is ongoing and Samuele Pedroni is aiming for a 15 November check-in of the new branch into sourceforge. Once we get that in, progress in Jython-land can proceed in multiple parallel-roads at once e.g. core language work, library work, build system work etc. etc. Thus spaketh Ganesha + Minerva + Thoth! "Being a hopeless seeker of generalizations, I cannot help but wonder where this phenomenon will take us next? It appears as if a meme has taken shape around the use of the word 'planet' so it might be no harm to extrapolate the analogy for guidance as to where we may be headed." No. I'm not going to give you a hint. The rest is here. "open the file foo.baz with your favorite text editor." "decompress the sample files with your favorite compression tool." Favorite? What has favorite got to do with it? It is my business if I choose to use the programs I most hate on the planet to edit the files or de-compress the archive. Ooops! I feel a literal-interpretation spasm coming on. Attribute nodes and children first into the life rafts. Abort, abort! Wrrrrr. Click. Wrrrrr. Click. OpenOffice 1.1.3 has been released. It is a bugfix release. Details here. A new bugfix release of the baseline RIGs is now available. There is still a whole bunch of work to be done on RIG 4 so there will be another release of that RIG soon. A public "thank you" to those of you who sent in obs. Your help is greatly appreciated! I have uploaded a PDF (950k) of my closing keynote from XML Open 2004. The slides are heavy on pictures and light on text. They probably will not make a huge amount of sense on their own, but here they are anyway. Alan Kennedy has announced modjy a WSGI server for Jython 2.1. The power of Jython in a servlet container has to be seen to be believed. It has a way of leaving you in a giggling wreck thinking about how you *used* to do it before you cottened on to Jython. I sense a mind bender creeping over the horizon. "Computational properties of nervous tissue." That sort of mind bender. Gmail + Atom/RSS. The death knells of POP3/IMap4? The Web claims another protocol victim? Some Fats Waller sounds on your MP3 player would be a suitable background to this article : The Jazz approach to E-Business integration. I have been using trang a lot for quite a long time. So, it came as a great shock to me to realise that I had somehow missed some very powerful capabilities it posesses. There I was, flicking my way through XML Hacks when the book fairly shouted out at me that trang can generate schemas from instance documents. I never knew that. I have no idea how come I never managed to internalise that (now blindingly obvious) fact. Wonderful! This riffs rather nicely with an upcoming ITWorld article on the subject of ex post facto formalisation of schemas in XML app dev. The 'why' and the 'how' of business processes explores the relationship between state machines and control logic and in particular, what we can usefully visualize and what we cannot. At XML Open 2004, Uche pointed at http://www.eekim.com/distcomp/dialogmaps/soapproblems.html in his presentation. Fascinating and terrifying at the same time. I had a good time at XML Open 2004 which ended today. Met some new faces and bumped into some old ones (the faces were not necessarily old...you know what I mean). My favourite talk was Peter Rogers talking about 1060 NetKernel. A very interesting system - Zope'ish in places with nice XML processing pipelining features and a powerful caching architecture which looks like a very good fit with just-in-time XML transformation pipelines. There, I said that word again - pipelines. Long before I got up to do my pipelines talk, the word had been used in a bunch of presentations (Cocoon, XForms) and a bunch of coffee-conversations (DSDL, XPipe). Unless this conference took place on the summit of some off-the-wall statistical outlier, I believe pipelining cometh. It appears to have entered the collective consciousness of the web publishing geeks, hard-core XML docheads, XML OS creators and uber-XML-validation fans, all at around the same time. I believe the presentations and some audio/video of some of the talks will be made available. I'll point to the stuff when it appears. Talking to Kal Ahmed at XML Open 2004 today I found out about his rng-tools for generating documentation from Relax NG schemas via XSLT. This weeks ITWorld article addresses some aspects of e-mail privacy : Envelopes, postcards and e-mail privacy. "No matter how hard I try, I still think the WS-* stack is bloated, opaque, and insanely complex. I think it’s going to be hard to understand, hard to implement, hard to interoperate, and hard to secure." Yup. That pretty much covers it. The whole WS standards thing has more moving parts than a 747. Much of it recently invented, untested and unproven in the real world. I believe WS-YouMustBeJoking is doomed to collapse under its own weight. Good riddance to it. Why has this situation come about? Because smart people had neural spasms? No. Because smart people realise that this stuff is *real* important and commercial agendas are at work all over the map. The most important document to read if you want to understand the WS-IfThisIsProgressImAMonkeysUncle cacophony is How to wage and win a standards war by Carl Shapiro and Hal Varian. into my apps without contorting the design. It works a treat. Dramatically improving the performance of IO bound applications without sacrificing any of the beefy goodness of the XML underneath. I can even modify XML files in running apps, safe in the knowledge that at load time, the XML version will be parsed and the stale "compiled" version thrown away. Translated into English, it blows the stack after 1000 nodes or so. The XML Open Conference 2004 takes place next week in Cambridge, England. I'm doing a presentation on XML pipelining and also the closing keynote. I'm looking forward to it. I'm working on my keynote presentation this weekend. My last keynote in Cambridge used a lot of visuals. Many pictures, few words, few bullet points. I'm adopting a similar style this time around. Boy does it take time to create a highly visual Powerpoint! And hey, lets hear it for http://images.google.com without which... etc. Recently I contributed a couple of XML hacks to an O'Reilly book of the same name. One of these hacks - using SGML to help auto-tag XML - is covered in a new article by Mike Fitztgerald : http://www.xml.com/pub/a/2004/09/15/XMLHacks.html. Join RFID technology with the concept of M-Commerce and something interesting happens. Firefox and Thunderbird - get them. No questions. Just do it. The Firefox/Thunderbird Browser/E-mail client combination is wonderful, keenly priced [:-)] and getting better with every release. Propylon are looking for Python/XML programmers. Opportunities in both Dublin and Sligo offices. Contact me if interested. Whenever two systems need to "talk", the nature of the speech acts to be used raises its head. Do I talk while you listen? Do I ask you a question and you answer me? Do I state a fact and broadcast it to anybody who happens to be listening? Do I sit back and say "go on, ask me a question"? Some of these choices can be safely relegated to implementation detail. i.e. technically speaking, numerous options can be made to work. However, some are directly impacted by the boundaries - both physical and organisational - between the communicating parties. In the Public Services Broker - an SOA based integration infrastructure under construction in Ireland, many of the services connected to the PSB will be hosted by agencies separated from the PSB both physically and organisationally. As a consequence, it is necessary to analyse the various possible meessage exchange choreographies and take these "business" issues into account. The document Push and Pull Message Delivery in the PSB Architecture is a position paper on the topic. Although the document is specific to the PSB, the questions discused have a wider applicability in any SOA based on an asynchronous messaging substrate. I guess. Its a problem. All guesses have bigger guesses, on their backs to bite them. And smaller guesses within those guesses, and so on, ad infinitum. With apologies to Augustus de Morgan and all the world's fleas. Guesswork features in a lot of software. We like it. We want it. It makes software smart. Or does it? Deleterious guesswork in application integration is an ITWorld article that ponders the pros and cons of the guessing game we call data processing. What is a 'brittle' interface? Brittle interfaces are bad right? But do you and I mean the same thing by the word 'brittle'?. Read what is a brittle interface? to find out. Create a 1 GIG mountable filesystem from your GMail account. Sometimes you just gotta smile. """Therefore, I propose to many of my clients to use the WS-* standards as a checklist for their designs. I generally do not recommend they use WS-Addressing or WS-ReliableMessaging (or at least not right out of the gate). I do, however, challenge them by asking, "What is your strategy to track messages in case of error?" or "How do you intend to support asynchronous messaging?" The answer has sometimes little to do with Web Services. For example, the answer to reliable asynchronous messaging might be to use JMS or MQ or another middleware that ensures guaranteed delivery of asynchronous messages. And that's OK. ..."""
It is truly amazing how much you can do just with URIs (applied RESTfully) and an underlying off-the-shelf, boring-as-the-day-is-long reliable asynchronous messaging substrate. If you have better things to be doing than tracking WS-Palimpsest and struggling to debug WS-InterferencePatterns, I suggest you get an asynch messaging substrate in place, off the shelf *now* and work forward from there. Hao He has a nice article on xml.com : Implementing REST Web Services: Best Practice and Guidance. I especially like the pipe-and-filter design which is at the heart of how we do things in Propylon. Data flows and data transformations are just full of natural goodness. I was not aware that the pipeline technique has a heritage back with Richard Feynman and his work on that atom bomb. A fascinating particle of information! Anybody out there got any pointers? I tend to point to Henry Ford, to Adam Smiths 'Inquiry into the wealth of nations' and Herbert Simon's 'The architecture of complexity'. James Strachan has announced ActiveMQ 1.0. I am organising a Python meetup in Dublin for, hopefully, early evening Thursday September 9th. See python.meetup.com. I don't know about the meetup.com side of this. Lets see how it works out. If you are interested in meeting up, please contact me by e-mail or leave a comment on this blog. This weeks ITWorld E-Business in the Enterprise article : Nano-technology and the onward march of digitization. Do you believe in open standards? If so sign here. Via Jon Udell comes *big* news for Python fans. Jim Hugunin, the creator of Jython, starts work with Microsoft Monday chartered to work towards a production-ready IronPython, and more broadly to improve the state-of-the-art of dynamic languages on the CLR. Steve Vinoski has published a useful article on dynamic languages in middleware : Dark Matter Revisited. My position on this is simple. Anyone coding middlware in a statically compiled language, working in a commercial environment where time is money, has rocks in their head. I will be giving the closing keynote and also giving a presentation about the joys of XML pipelining at XML Open 2004. I was in Cambridge a while back at the Optimal XML conference where I did the opening keynote. XML Open 2004 will be more of a challenge as I will need to pull together themes of the conference. Necessarily, it will be a more "on-the-fly" gig but all the more interesting for that. b)the difference between software as a a hider of complexity and software as expressor of ideas. There are sessions on Web Services, DSDL, Groovy, Python, Topic Maps, RDF, XPath 2.0 and W3C XML Schema which should provide ample raw material. leaving Bea to join Google. Of course, it could be usurped by "event driven architectures" or some such. Ain't soundbite wars fun? Raid on Tumbolia: A rescue mission for business data. I'm off on hols and going cold turkey on e-mail, blogging etc. I'm off to a health farm. Actually, no I'm not. That is a lie. I'm off to walk around Barcelona and eat my way throught its fish restaurents with my family. (It amounts to much the same thing:-). Bloglines is a year old today. I find it indespensible. Unfortunatly, its popularity has rendered by site stats system rather ineffective. 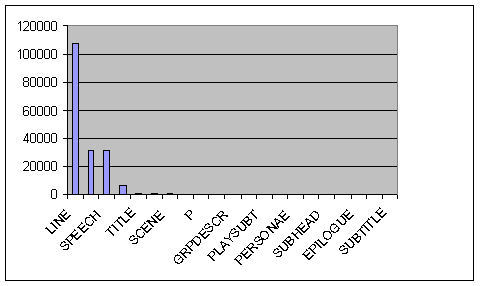 90% of the entries are of the form http://stats.blogger.com/redirector.pyra?t=http%3A%2F%2Fbloglines.com%2Fmyblogs_display%3Ffolder%3DNNNNN. Is there a way to work back from this to the bloglines identity I wonder? THis weeks ITWorld article Two HTTP verbs diverged in a wood... is all about idempotency although the word is never mentioned. Python and Java technology work together to solve the impossible is the title of an article over on IBM Developerworks. [via Daily Python URL]. Jython is a wonderful tool to have in any test-driven application development plan. The speed with which you can implement new tests, slice and dice exisiting tests, create smart "batch" runs of tests etc. with Jython has to be seen to be believed. If you are developing tests of Java code in Java. STOP RIGHT NOW! :-) Double your productive day with Jython. (I'm not kidding.). Interesting, JDNC is now open source. Rich client development is an enigma in computing. It never ceases to amaze me how complex and ugly GUI code can get once you start doing serious app. dev. I have played with patterns like MVC, languages like Smalltalk, Python, Java, C++ etc. and never been happy with the code I've written for any of them to drive GUIs. My latest theory is that GUI design lends itself to complexity because it combines an exploding state space with an exploding namespace. The state space problem come from the need to handle modeless dialogs and the freedome they give users to trigger events in combinatoric orders. The name space problem comes from the fact that every event, every widget, every method, every callback, every include file, every bitmap, every mask, every state variable has a *NAME*. Keeping GUI code from suffering entropy death involves constant, care and feeding of *NAMES* and that is very laborious and error prone in my experience. THe more open source projects we have to do with rich GUIs the better. Doing it well, with the flexibility for change required in business-oriented applications, is a far-from-solved problem. My own favourite cross-platform GUI (surprise, surprise) is wxpython. It does a very good job of alleviating the cruft attack of GUI-dev whilst leaving you access to the power of the "metal" underneath. Combined with py2exe, it is a powerful way to create Windows executables for distribution that do not require separate Python installs. Hmmm, jython + JDNC = wxjython for Jave GUI App. Dev? As regular readers of this blog will know, I have been working for a while with the Irish Government on Enterprise Architecture and Interoperability. Part of that work has been contributing to a document Key Principles of an Interoperability Architecture. [PDF, 41 pages] produced by the European Public Administration Network eGovernment Working Group. The document may be of interest to anyone interested in e-Government enterprise architecture, interoperability and/or service oriented architectures. Carlos predicts the iminent rise of REST and fall of SOAP. Interesting times. This week's ITWorld article The color of words concerns the non-use of color as a cognitive aid in word processing. After twenty years in the SGML/XML markup trenches, I have come to the conclusion that for narrative-heavy structured documents, color coding inside an otherwise normal word processor has a lot to offer over more traditional in-your-face structured authoring approaches. Take something like OpenOffice for example. A nice clean XML notation for the base files. Yummy. Now add a customisation layer to allow colour coding to be used instead of custom tags by authors/editors. Now add a two-way converstion from the colour coded markup to semantic markup and versa visa. Whaddaya got? A lot. Not least of which is a happy author/editor community - a rarity in the in-your-face semantic markup world. Micah Dubinko of xForms fame, is playing around with using simple HTTP GET/POST to URI-ify his local data. By coincidence, I have an ITWorld article on that subject coming up in a couple of weeks. The question that most interests me is the difference between treating a local space (such as a hard disk) as a namespace of un-interpreted data (a file system) versus treating it as a local space (such as your locally installed apps) of interpreted data. Question 1: How many applications do you use all the time? If you are like me, you use a large number of applications some of the time but a small number of applications, most of the time. Question 2: What interesting integration possibilities would present themselves if the applications responsible for creating the data on your file system all had web servers and provided processed "views" of this data to web browsers? I have been responsible for numerous hacks over the years in my work. It goes with the territory. Recently, I discovered that we modern day Irish may be genetically pre-disposed to the quick, inelegant but highly performative solutions known as "hacks". 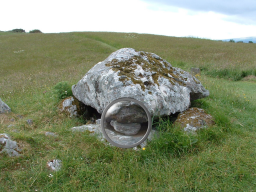 Sligo in a place called Carrowmore. Carlos comments on the one-sided nature of Liskov's Substitition Principle. As I've said many times, in a document-centric, message-centric world, objects are not the center of the universe so API substitutability is not a useful metric for compatibility. (Example, in REST, there is only one "API" so substitutability does not arise). I think Carlos is right when he says we need to look at both the "provider" and "requirer" sides. We need to focus on foreward and backward compatability of message *notations* by means of a message processing model, not API comptability through polymorphism. RIG 6 in the interoperability guidelines I am working on with the Irish government for the public services broker, addresses this issue. Dave Orchard is well worth reading on this topic. Great stuff from Greg Wdowiak on document-centric integration and the perils of APIs. said yes I will Yes. Data Storage and Data Transmission is a transcript of a short paper I delivered last week at a technology seminar held in Carrowmore by the IPTT (Inter-Planetary Technology Troika). Delegates from all three members: Earth, Tlön and Tralfamadore were in attendance. I will be presenting a short paper on the Service Oriented Architecture underlying the Public Service's Broker at ECEG 2004 in Dublin Castle later this week. If you are coming to the conference, please come up and say hello. It is not well known that the truly wonderful and keenly priced Paintshop Pro V8 contains a fully blown Python engine as its scripting language. Getting started with scripting PSP is simplicity itself as you can just save a macro and then edit it to do funky stuff with all the power of Python behind you. Also, it appears that big chunks of PSP seem to be written in Python. I counted about 1500 scripts in there...Lots of sources to crib from. 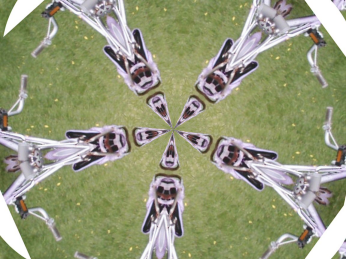 Anyway, I'm very fond of the Kaleidoscope effect in PSP. You specify a bunch of parameters angles, offsets rotations and the like and off it goes. Sometimes the results are dull. Most times they are interesting. Sometimes they are amazing. For fun, I wrote a PSP Python script to generate 100 Kaleidoscoped images with ramdomized parameters and save them off to disk. I ran it. Got a bunch of duds but some really beautiful effects. What does that look like to you? Bees converging for a conversation? Now be honest, would you have guessed that this came from an innocuous picture of wife and child on front lawn? Yup. I kid you not. I think I'll generate a 1000 overnight and examine my crop in the morning. In scheme eq? compares for equality in the sense of if both args point to the same object, then #t. In Python the number 1 is an object. There is one such object. If x and y both = 1, then both x and y point to the same object. Scheme R5RS does not require that numbers be implemented this way and thus (eq? 1 1) can return false in one implementation (e.g. SISC) and true in another (e.g. MZScheme). Thanks to Matthias Radestock for pointing this out. Being an insufferable Emacs bigot I personally would have no use for this but its great to see Jython support appear in these IDEs. Ted Neward responds to Dare Obsanjo on the whole XML serialized objects thing. "Dare, please, be serious for a moment--do you sincerely believe developers in Java and/or .NET are going to give up their favorite programming model (objects) in order to do Web services? When we put rubber to road, if interoperability is going to work (and I fail to see why we're doing Web services if that isn't the goal), then we have to have BOTH ends of the pipe under consideration when we do this. That in turn means I have to ensure that stuff being returned from the Web service is easily consumable in platforms beyond XML. " 1. I believe developers not only should but must look passed the object-centric model to realise any benefit from Web Services. 2. Interoperabilty is not achieved through shared objects. Interoperability is documents. Interoperability is syntax. Interoperability is bits on the wire. Objects are not the answer to distributed computing. Objects are the question. Documents are the answer. Scheme woes - too tired now. Will be obvious in the morning. insertR is a function that adds its first parameter into a list (its third parameter) directly after the first occurence of its second parameter. This weeks ITWorld article: e-mail - the end of a metaphor. Congrats to Rick Jelliffe on producing the final draft of ISO Schematron - part 3 of DSDL (ISO 19757-3). You can get the PDF here [30 pages]. Here are four graphs (click on the image for bigger version). subject matter, the similarity in the graphs is striking. 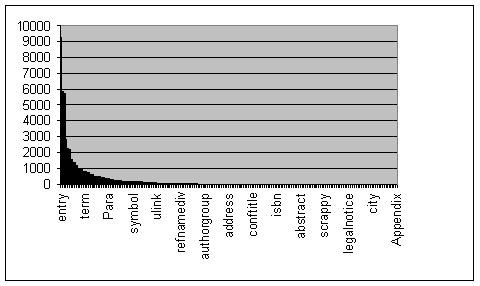 The graphs are produced by charting element types against frequency of occurence. and they always take the same general shape. I call it tag share analysis. up/down/cross-translate in XSLT or DOM/SAX or whatever. A remarkably small number of element types make up the bulk of the markup - regardless of the size of the schema. Ding ding ding - come and get it! Python 2.3.4 is now available. 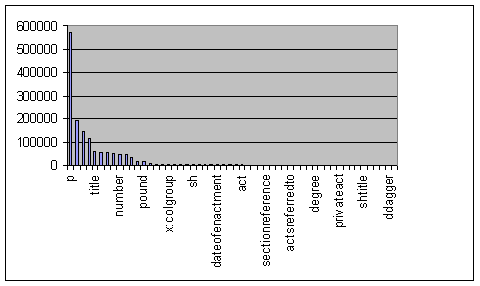 Here are contributions for Python, Perl and C++ http://dev.r.tucows.com/blog/_archives/2004/5/26/76434.html. "The recent rise of Service Oriented Architecture seems to mean very different things to different people, but one plausible thread is a rise of autonomous applications with their own Application Database that communicate through service interfaces - effectively replacing shared database integration with rpc or messaging based integration. I'm very sympathetic to this view, particularly favoring integration through messaging - which is why I encouraged the development of EIP In this view of the world the integration database is no longer the default assumption." EIP. "Enterprise Integration Patterns. Designing, Building, and Deploying Messaging Solutions"
by Gregor Hohpe, Bobby Woolf. "In all branches of cognitive endeaver, our highest praise is reserved for works that build the deepest hierarchies." Ok. That explains the number of musicians and audiophiles I come across in the XML world but does it justify docbook? :-). Forget about business process execution languages and belocolus "business process engines" that will protect you from all harm. Your problems do not stem from the lack of a silver bullet syntax or the lack of a killer programming language feature. Your problems lie in two fundamental concepts that need to be central to how you think about business processes in a distributed world - (a) event driven execution and (b) temporal decoupling. Without those, all the WF*, BP*, WS* and *ML's in the world cannot help you. More on this line of thought in this week's ITWorld aricle : When modelling business processes, upside down is the right way up. Michele Simionato explains the C3 algorithm for Method Resolution Order as used in Python 2.3. Those not interested in same might like to take a look simply to marvel at the ASCII art. Via Radovan Janecek comes this interesting 3 page PDF Microsoft's Next Frontier. Loose coupling via stateless, message oriented interactions. Yummy. Domain Specific Languages. Doubly yummy. As I see it, C# and Java are today's assemblers. Speed of application delivery trumps speed of application execution 99 times out of 100 (welcome to capitalism). Then there is Moore's law. Add them together and I think its likely that the action will move to DSLs (Domain Specific languages0 that target the VMs for those two runtimes). DSLs that allow developers to work naturally with documents as first class "objects" (for want of a better word) are required. In years to come, I hope we all collectively cringe at todays crop of Event/Pull/Tree/Marshalling abstractions for XML processing. LAML, xduce and HaXML offer tantalising glimpes of where we might be headed. (I predict lots of GUIs fronting these things). DSLs that allow "event driven" business process description. PI-Calculus is on everyones lips but don't forget Petri-nets or even plain old Finite State Machines. DSLs that embrace the dynamic typing implicit in moving "type checking" away from objects/records and into document types (grammers). (Jython for dynamic typing, maybe something like Haskell's polymorphic types with some sort of native type for Tree Automata ) for those who want compile time document type validation. DSLs that cross-translate to XML (XNFs = XML Normal Form:-) but provide human-oriented grokkable syntaxes. RelaxNG Compact Syntax leads the way but I predict the XUL's/XAML's of this world will follow suit.